As we are constantly striving to improve our product design, we are proud to launch the 'Penfro Coop'. This model gives better ventilation, as well as being pleasing to the eye. Based on customer feedback, we consider this an improvement on an age old design. The roof is designed to allow excellent airflow and ventilation as well as being pleasing to the eye. 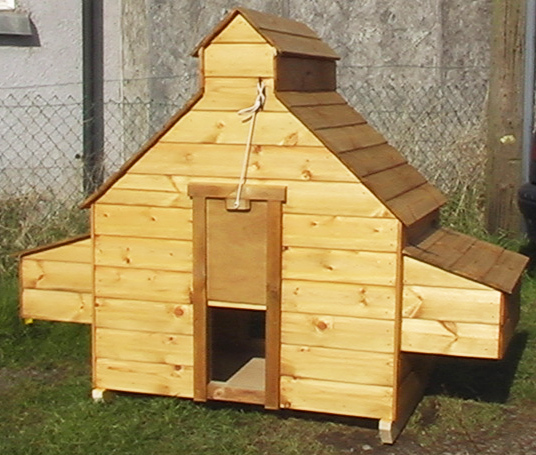 Constructed from solid 16mm shiplap instead of felt to avoid redmite infestation. Large door at rear for easy access and cleaning. 2 nest boxes accessed through a hinged roof. The roost has a floor area of 14ft2. External dimensions excluding nest boxes: Depth 31", Width 48".